But thereʼs a silver lining to this dark cloud: You can still make a personal difference in preserving glacial ice. Even if we somehow stopped climate change dead in its tracks right now, recent research shows that more than a third of the world’s 200,000 glaciers would melt anyway. That’s because glacial ice takes decades to fully respond to the human-caused global warming that has already occurred. And as the inevitable thawing continues, meltwater flowing into the oceans will contribute to sea level rise, posing challenges for low-lying coastal cities already struggling to cope with flooding. “Whatever we do, we have little wiggle room left because we have already committed to melting a large fraction of the ice,” says University of Bremen climate scientist Ben Marzeion, lead author on the study, which was published in the journal Nature Climate Change. I spoke with him at the Arctic Frontiers conference in Tromsø, Norway last week. Findings like these can make us feel helpless, because they suggest we have little influence on the course of climate change. But there’s also a flip side to Marzeion’s research, one that offers an antidote to helplessness: In addition to documenting the inevitability of glacier melting, his findings also show just how much of a difference each one of us can make in saving glacial ice. For his research, Marzeion used climate models to feed information on temperature and other climatic factors into other models that predict how glaciers will respond. In particular, he and his colleagues focused on the kind of glaciers found in mountainous regions like the Alps, or in Norway’s Svalbard archipelago, leaving Greenland and Antarctica’s giant ice sheets out of the analysis. It’s not that melting of ice in Greenland and Antarctica are unimportant. In fact, research published last week shows that Greenland’s ice is melting faster than previously thought and will likely trigger faster sea level rise in coming decades. But big ice sheets and the smaller glaciers of the kind included in Marzeion’s study are different beasts. And better understanding of how the latter are responding to human-caused warming is vital. That’s because their melting is already contributing about half of the 3 millimeters per year of global sea level rise currently being observed. That works out to about 0.05 inches annually. By comparison, Greenland has lately been contributing about 0.03 inches to sea level each year. In one of a number of modeling scenarios Marzeion and his colleagues undertook, they examined what would happen if we somehow kept the climate as it is now — a little less than 1 degree C warmer than it was in preindustrial times. In other words, the glaciers take time to respond — they haven’t yet caught up to the climate warming we’ve caused so far. Turning off climate change overnight is obviously a physical impossibility. But we can work to limit future temperature increases by reducing how much heat-trapping carbon dioxide we’re pouring into the atmosphere. The Paris Agreement on climate change was intended to do just that. So, how much of a difference could the agreement make for the glaciers? Signatory nations committed to restraining global warming to well below 2 degrees C above preindustrial levels — and preferably to no more than 1.5 degrees C. Achieving that goal would reduce risks of a number of other climate change impacts, such as heat waves and droughts. “But with 1.5 degrees of warming, or four or five, we see only a little difference in glacier melting,” Marzeion said. If we kept global warming to just 1.5 degrees C, the modeling shows that about 52 percent of the glaciers would still melt in the long run. If we limited it to 2 degrees C of warming, 62 percent would melt anyway. To help me understand why glaciers respond this way, Marzeion asked me to imagine taking a large ice cube out of the freezer and placing it on the kitchen counter. In the much warmer room, the ice would begin to melt. But it would take a little while for the melting to become obvious. With global warming, “this is essentially what we’re doing with the glaciers,” Marzeion said. We’ve already taken them out of the freezer. And while we’ve seen melting because of it, they have not yet fully responded to the warmer temperatures. Now, let’s take the analogy a little farther. If you want to stop the large ice cube from melting any further, you’d have to put it back in the freezer. For the glaciers, that would mean going back to the temperatures of the pre-industrial era. That’s extremely unlikely. But what if we put the ice cube in the refrigerator next to, say, the milk carton? While temperatures in there are cold, they’re not below freezing. So the ice cube would still experience melting. But it would do so much more slowly than if we left it on the kitchen counter subjected to room temperature. Similarly, by limiting future temperature increases through reductions in greenhouse gas emissions, we can slow down glacial melting. That’s important because a slower pace of melting means that it would take longer for sea level to come up, giving societies more time to adapt by, say, building dykes and shifting development to higher ground. At the individual level, it may seem that having an impact on something as big and complex as climate change is futile. But Marzeion’s study shows otherwise. Each of us actually can make a difference. He and his colleagues used their modeling results to look at the impact driving a car has on glacial melting. For an average non-electric European automobile, they found that driving 300 meters — about the length of a football field — spews enough CO2 out of the tailpipe to eventually melt one kilogram of glacial ice. Especially given the immensity of the world’s glacial ice, at first blush that didn’t sound like very much to me. But then I considered how much I drive: in some years, as many as 15,000 miles. And that adds up to at least 90 tons of melted glacial ice — 50 times the weight of my Subaru Outback. All that melted ice contributes to sea level rise, each and every year. And actually, these numbers are conservative because an Outback almost certainly gets worse gas mileage than the kind of car Marzeion and his colleagues used to make their calculations. “So now, when you are in your car, you can imagine that for every 300 meters that you drive, you are dooming about one kilogram of glacier ice,” Marzeion said. And more if you drive an SUV. Your’s truly (Tom Yulsman), holding a chunk of ice that had calved from a glacier in Svalbard in 2016. It turns out that switching from a car to a bike over just a short distance — less than the distance to my local grocery store — I can save from melting much more ice than that. To get a sense of the positive impact I personally can have, I flipped it around: With every length of a football field I cover on my feet or my bicycle as opposed to my car, I can conjure a distinct image of putting a 2.2 pound block of ice in a freezer. Scale that up to driving, say, 5,000 fewer miles annually, multiply that by tens of millions of people taking similar steps — and now we’re talking about saving a whole lot of ice. True, as Marzeion’s research shows, a large fraction of the world’s glacial ice is already committed to melting no matter what we do, and that will contribute to sea level rise. But we can slow things down, making adaptation easier. And if we really work at it, we can even preserve some ice. Moreover, Marzeion’s results show that we would get a bigger response by getting started right now. Given today’s climate, for every kilogram of CO2 that you or I can keep out of the atmosphere by, say, driving less, we’d save about 15 kilograms of glacial ice in the long run. But if we wait to start biking more, or maybe replace the gas guzzler with a hybrid car, we’ll experience diminishing returns. According to Marzeion, once the world warms in coming decades by 3 degrees C, then every 1 kilogram of CO2 kept out of the atmosphere will save just five kilograms of glacial ice — three times less than if we got started now. That’s because the extra warming between now and then would would commit much more ice to melting. Unfortunately, global emissions of CO2 continue to rise, and over the long term, the greenhouse gas continues to accumulate in the atmosphere at ever higher concentrations. As a result, on our current path we’ll have less time to adapt. How much less time is “very hard to specify,” Marzeion said. In part that’s because the world’s glaciers aren’t the only variable. Greenland and Antarctica’s giant ice sheets have the potential to raise sea level much more. But predictions of their behavior in a warming world come with greater levels of uncertainty, he told me. Moving forward, Marzeion confided that his research findings have provided him with a new and personal way to gauge his own impact on the world. He notes that he and other glacier experts all tend to have their own favorite glaciers. “So now we can imagine how our personal actions are affecting that glacier,” he says. With that understanding, perhaps we can step onto a different path — figuratively and literally. Please save the Arctic immediately because the polar bears rely on it to hunt for their prey and we have to shutdown everything that is causing this horrible global warming. Maybe! You could say that. We need to have a better future and keep Arctic ice and the tundra protected no matter what as well as its wildlife, so we must all work together and save the Arctic and its ice as well as the Antarctic ice. Mr. O’Brien: This is a science magazine. So if you would like to continue posting comments here, please drop the snark and say something intelligent, relevant and based in scientific reality. Otherwise, take it somewhere else. Good idea but the United States is already leading the way in reduction of greenhouse gasses. The main producers are China and “Other”, aka 3rd world countries struggling to join the developed nations. How you convince billions of people to give up that ambition I have no idea. the “drive less” solution has been debunked a long ago. a cheeseburger has the same emissions as half a gallon of gasoline. the consumers’ impact is not as relevant anyway. So why the worry? This is only the 5th ice age we are still leaving. By your own accounting something has sped up the loss of glaciers to the point that they will be gone 800 years faster. Just maybe we should look at that as a sign that something odd is going on. To be more clear…the glaciers are a sign of a problem. They have their own issues they will cause as well…namely increase sea levels…but they are primarily used as a measuring stick on the climate. Rodrigo: I don’t get my science from MGM. I get it from scientists. And through painstaking research, they’ve shown that global temperatures did indeed begin to warm at the end of the last ice age about 11,000 years ago, but after 6,000 years, that trend reversed. Starting in about the year 5,000, cooling ensued — not warming — until the industrial revolution. Temperatures have risen steadily since. Today, global temperature is now higher than during 90% of the entire Holocene period. In case you would like to check out the science for yourself, you can find it here: http://science.sciencemag.org/content/339/6124/1198.abstract. It is much more authoritative than a movie company. Of course, glaciers have been a very rare commodity over the last 660 million years. Quite possibly ‘normal’, as defined by an average, is warmer than the current epoch. There was a lot of “scientific tripe” printed here, but glaciers have been melting for 20,000 years. It’s not man made. “Science” can’t have it both ways. CO2 is NOT a pollutant. It’s necessary for plant growth. The more CO2 we have, the more plant life grows to counteract the CO2. Ice core samples do not support CO2= more warming. “Global Warming” is a political movement to transfer first world money to 3rd world pockets. Socialism is a bigger problem than my car. Burning cow dung in Africa kills more people than my “gas electricity”. We are producing morons through the educational systems in modern countries. Education should make thinkers instead of propaganda robots. We now have a previous bartender as a congressman from NYC that has stated we will all die in 12 years. If we do, it won’t be from global warming. There is NO evidence that warming is any worse today than 50 years ago. in fact, the warmest time in modern history was back in the 1930’s in the “dust bowl”. We aren’t even close to that today. Nothing you have said in your post above in any way remotely resembles accurate science. We literally have temperature readings, both from ground sites and from satellite atmospheric readings proving that global temperatures are rising. As for your political statements, they give plenty of insight into the biases in you bring to any discussion of this topic. It is rather ironic that you bring up propaganda here, after spilling nothing but political rhetoric. Glaciers have indeed been melting since the last ice age, but that rate of melt has measurably increased during the past century. That is beyond debate, and has been documented by every scientific agency that’s researched the matter. As for the correlation between the rising temperatures and rising CO2, that has also been proven beyond reasonable doubt, as climate models have taken into account variations in solar output and any other factors that would raise average global temperatures. Finally, a solution to the problem does not have to be socialist vs. capitalist, but should involve whatever approach most effectively alleviates the worst effects of climate change without imposing undue hardship on those who can least afford it. If you can at least bring yourself to admit there is a problem, we can reasonably debate the solution. Until then, you’re actually part of the problem. Mr. Chuckles: If you would like to keep commenting here, be serious and refrain from ad hom attacks like accusing me or anyone else of presenting “scientific tripe.” I worked very hard and in good faith to report this story. You are absolutely welcome to disagree with what I wrote, but be a grownup and show some respect and intelligence. If you can’t manage that, please take your nasty bile somewhere else. There are plenty of platforms that will welcome it. Not this one. All I know is I’m 67 yo now and have been told for decades now how we are all gonna die in a few years. Remember the coming Ice Age in the 70’s? How about the population bomb? How about “peak oil”? I have a copy of AlGore’s “Inconvenient Truth” and ALL of his predictions have come and gone. How many times in the last 20 years have we read headlines about the “books” will have to be rewritten? “Scientists” seem to carry a lot of credibility until the facts come in. Who asks them to retract their bilge? They keep getting the government contracts so they never really do any real science. The problem today is kids are being taught this propaganda and they lack the ability to think for themselves. The truth is sunspots grow and recede in 11-17 year cycles and eventually it will get warmer, until of course it gets cooler. The glaciers have been melting for thousands of years and it seems like they will eventually go away for whatever reason, but it’s arrogance to think man can cause it or cure it. If America taxes it’s people to the poor house, is China and India going to destroy themselves? When we stopped using R12 freon, it was supposed to reverse the Ozone depletion. A quick look at the ozone hole shows it’s still the same or a little larger. I was taught in the 1950’s that the solar wind flows over the earth and the magnetic field caused the Northern Lights and came out of the S pole removing the Ozone. I have encyclopedia’s from the 60’s that have theories that have been long disproved. Just because you say something doesn’t make it true. Following the crowd doesn’t mean you are somehow correct. You mentioned my politics. Well, what I see is your politics here. In the 80’s, C Span showed a conference that had the usual suspects meeting to speak about a “carbon tax” and “carbon credits”. They even admitted then that the third world would get the money raised. They were keeping Africa and other developing places in the dark ages by not allowing them to develop their own resources. If the world pays them subsidies, then they will keep cooking on dung fires with no electricity. How can Africa have so many resources with no power? Why not develop your own land and stop selling to outsiders? Because they accept billions from the west! It has NOTHING to do with ecology but money and corruption. Look at Venezuela right NOW! Rich beyond belief yet they are starving. They are socialists and that is the way socialists always end up, yet the smart scientists always lean to socialism. So I’m supposed to be impressed with AOC, a former waitress, telling me we will all be dead in 12 years? She is a moron. So who told her we will be dead in 12 years? Another moron! Is it bad that I specifically read this article just to come down here and see the crazies? I personally have believed the science of greenhouse gasses and the general idea that if we can ever lower pollution we should…it all seems simple to me. I do always shy away from the prognostication though. We are very bad at being sure about what will happen way down the road….that being said the one thing we have been good at is the overall temperature gain from increases in greenhouse gasses. So, I think temps will keep going up until we get it under control, and that will cause havoc. I don’t think we can accurately predict the havoc though…and that I think should scare us all even more. Humans have faced much worse odds over the past 200,000 years. We adapt, it’s what we have always done well. You do realize that changing our ways is how we adapt….and that is what we are saying we should do…right? I mean, adapting to a world where we survive easier is the whole point. We survive easier if we produce less carbon because our world is balanced better without it. It is adapting. If we don’t we do worse. 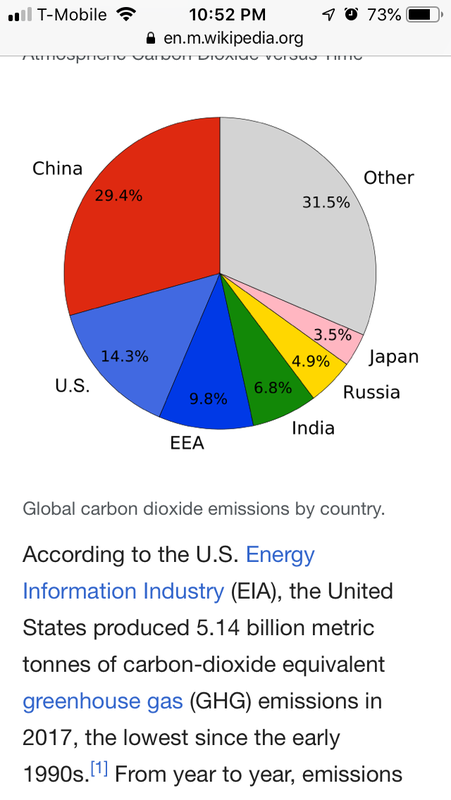 “Producing less carbon” is a lot more complicated than it sounds because the total amount of carbon in the atmosphere is produced by a multitude of countries, each with different economic concerns and priorities vis a vis climate. The view of Westerners in wealthy developed economies is vastly different from that of billions of people in less developed countries trying to climb out of subsistence living. Adapting will involve accepting that fact, the strong likelihood that not much will improve in the situtaion with carbon overall worldwide, and coming up with solutions to live with the inevitable.